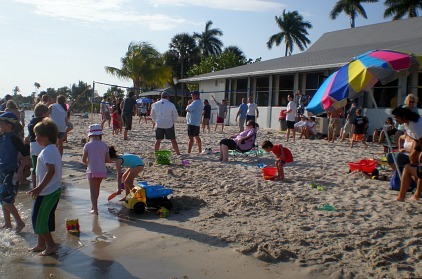 Cape Coral Yacht Club Beach - Check out our fun day boating, swimming, and picnicking in Cape Coral and other Southwest Florida beaches! 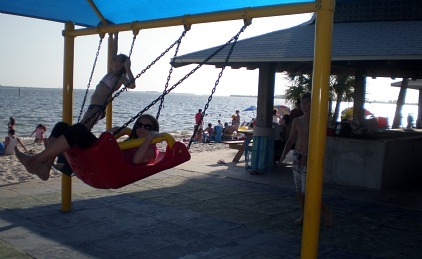 We really enjoy living in Florida ........ and we love that we can do all these outdoor activities year round. Here in the Cape, we are fortunate to have a cute little beach and access to so many others in the area. 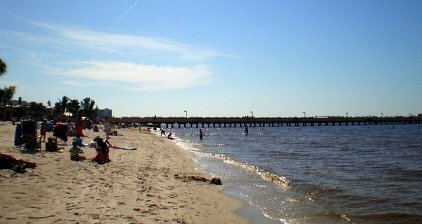 At the Yacht Club, we have nice soft white sand at our beach with either gentle or no waves, a fishing pier, snack bar, playground, beach pavilion, and community center ........ plus public swimming pool, racquet ball, tennis courts, boat launch, and marina. 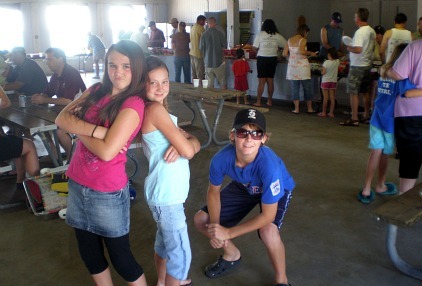 Our church was having a picnic at Yacht Club Beach, so we decided to make a day of it by going boating with friends first and then go back to the beach for the picnic. 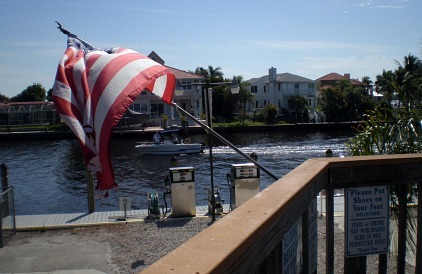 Our day started with a little swim at the Yacht Club, then we gassed up the boat at The Boathouse, the tiki bar and restaurant at the northern end of the beach. 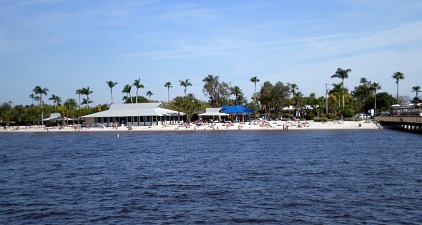 We headed over to Ft Myers Beach, docked in the water in front of the Lani Kai and had some lunch. Aaaaahhhh, there's nothing like swimming and floating on the turquoise waves, talking and laughing as we drift around the boat on boogie boards and noodles. Lots of people do the same thing and it becomes quite the floating party, it's so much fun! 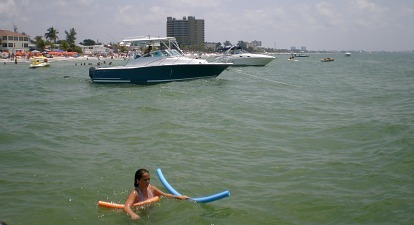 Well, after awhile, it was time to head back, but first we quickly sped by and checked out a few of the Sanibel beaches, Cape Coral came next over by Cape Harbour and Marina Village, then on we went to the Yacht Club for the picnic. A rousing game of volleyball was going on, as was sand castle building, monkeying around in the water, yakking amongst the moms ........ and climbing and swinging at the playground. Our meal was then served in the pavilion, which is available for all kinds of parties, craft shows, and other kinds of happenings. It's a wonderful little beach for families, you will have a great time swimming, fishing, playing, grilling, relaxing, and boating. 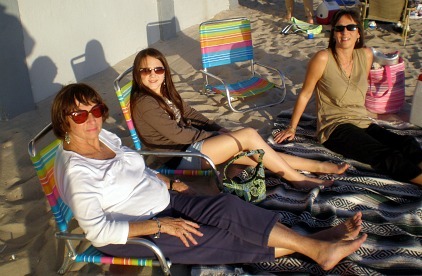 You will also want to go to fun events ............ don't forget to try the Yacht Club Beach Sunset Celebration! To get to Cape Coral Yacht Club Beach, go south on Coronado Pkwy from Cape Coral Pkwy, Coronado turns into Driftwood Pkwy, follow all the way to the end.